Combine the sticky rub ingredients in a large mixing bowl. Use your hands to rub the mixture into the spare ribs. Cover with plastic wrap and leave to marinate in the refrigerator overnight, or for up to 2 days. Turn the meat around in the marinade every 6 hours or so. When ready to cook, light a fire in your kettle barbecue. When the coals die down to about 160°C, scatter a small handful of hickory woodchips* onto the coals to create smoke. Sit the ribs on the grill, pull down the hood on the barbecue and cook the ribs for 3 hours. Every 45 minutes or so, add a few more woodchips to keep the smoke going. 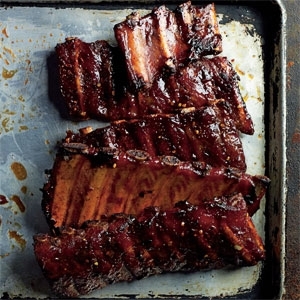 When the ribs are cooked, they should be wonderfully soft and tender, enough to fall apart in your hands. Serve with lemon wedges. * You can find hickory woodchips at most DIY stores.